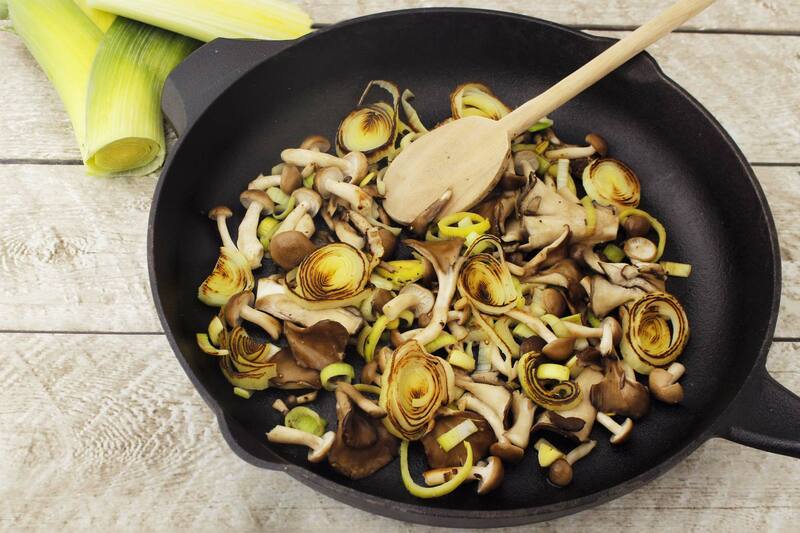 The delicately-mild onion flavor of the leek and the earthy, nutty flavor of the mushrooms is such a delicious combination. This is a quick and easy side dish that will be the perfect complement to your favorite meal. Chop off the green top part of the leek and the root off the bottom. Slice into 1/8-inch slices. Rinse in cold water to remove any soil. Pat dry. Heat a cast iron skillet or sauté pan on medium heat. Add in the oil and heat until oil begins to smoke. Lay the slices of leek flat on the skillet and caramelize, about 5 minutes. Toss in the mushrooms, garlic, salt and pepper and cook until mushrooms are tender about 10 to 15 minutes. Add in rosemary and cook until fragrant, about 30 seconds. Pour onto a plate and dust with Parmesan cheese.